Parents who are willing to support the religious principles and practices of the Catholic faith are eligible to apply to enrol their children at All Saints' Primary School. Enrolments for 2018 Kindergarten classes open Wednesday 31st May, 2017 and close on Thursday 25th August, 2017. 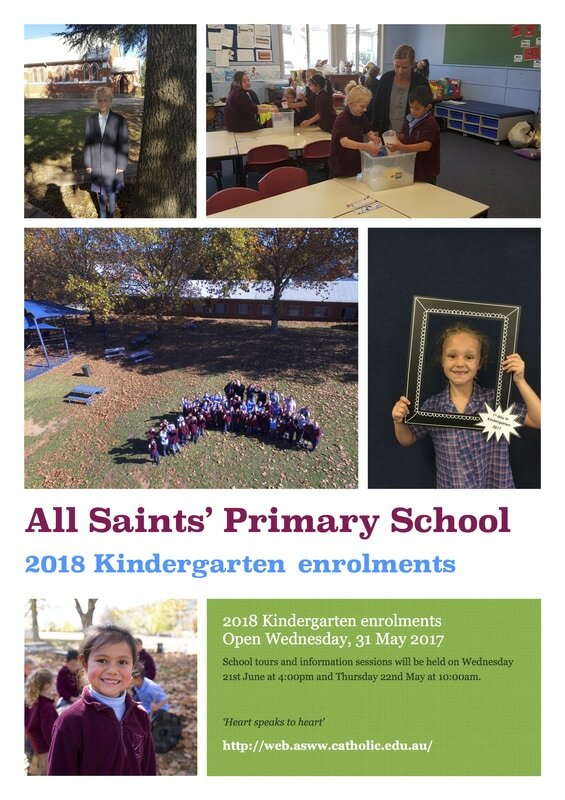 If you have a child turning five years old by March, 2018, you may apply for enrolment at All Saints' Catholic Primary School. Please note that any applications for children turning five after March 2018 are at Principal's discretion. by email, post or in person. an interview. (To be held during Term 3) Enrolment Interviews cannot proceed until all the necessary documentation is provided. (or nominee) generally within school hours. 2018 Kindergarten interviews will be conducted also in Term 3, commencing Tuesday 18th July through until Thursday 20th July 2017. 5. Attendance at interview does not guarantee a placement at the school. Please note that we cannot accept enrolment application forms which have not been completed fully and correctly or which do not include all supporting documentation. Enrolments for 2018 Kindergarten close on Thursday 25th August 2017 and ALL documentation must be provided by this date. * Baptismal certificate if your child has been baptised. Please read the application thoroughly to ensure that all relevant documentation is provided. If your child has additional needs, you will need to provide as much documentation as possible regarding their diagnosis and management when you return the application form, including any or all of the following reports: paedeatric, speech pathology, occupational therapy, early intervention. If you require further information about enrolments for children with additional needs, please contact the school office on 6925 1870. School tours will be held on Wednesday 21st June at 4:00pm and Thursday 22nd May at 10:00am. If you would like the opportunity to have a look around the school and find out more about it, please email or phone the office to book a tour. Please refer to the enrolment procedure listed above. Interviews for students enrolling in Years 1-6 in 2018 will be held in November 2017. For further information, please contact the office by emailing as-info@ww.catholic.edu.auu or phoning the school office on 02 69482395 or by calling in to the office between 8.30am and 3.45pm weekdays during school terms.